General Ulysses S. Grant is named as the overall commander of all federal armies. Union General William Tecumseh Sherman, with an army of 60,000, leaves Atlanta in flames and begins a march through Georgia on a 60-mile front, destroying everything that might be of use to the Confederacy. 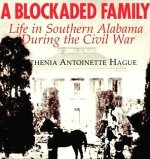 January 26 Confederate force fails in its attempt to take Athens, Alabama. Confederate cavalry, numbering about 600 men, attacked Athens, held by about 100 Union troops, around 4:00 am on the morning of January 26, 1864. After a two-hour battle, the Confederates retreated. Union forces, although greatly outnumbered and without fortifications, repulsed the attackers. In February, the commander of the Department of the South, Major General Quincy A. Gillmore, launched an expedition into Florida to secure Union enclaves, sever Rebel supply routes, and recruit black soldiers. Brig. General Truman Seymour moved deep into the state, occupying, destroying, and liberating, meeting little resistance on February 20, he approached Brig. General Joseph Finegan's 5,000 Confederates entrenched near Olustee. One infantry brigade pushed out to meet Seymour's advance units. The Union forces attacked but were repulsed. The battle raged, and as Finegan committed the last of his reserves, the Union line broke and began to retreat. Finegan did not exploit the retreat, allowing most of the fleeing Union forces to reach Jacksonville. General Grant, promoted to commander of the Union armies, planned to engage Lee's forces in Virginia until they were destroyed. 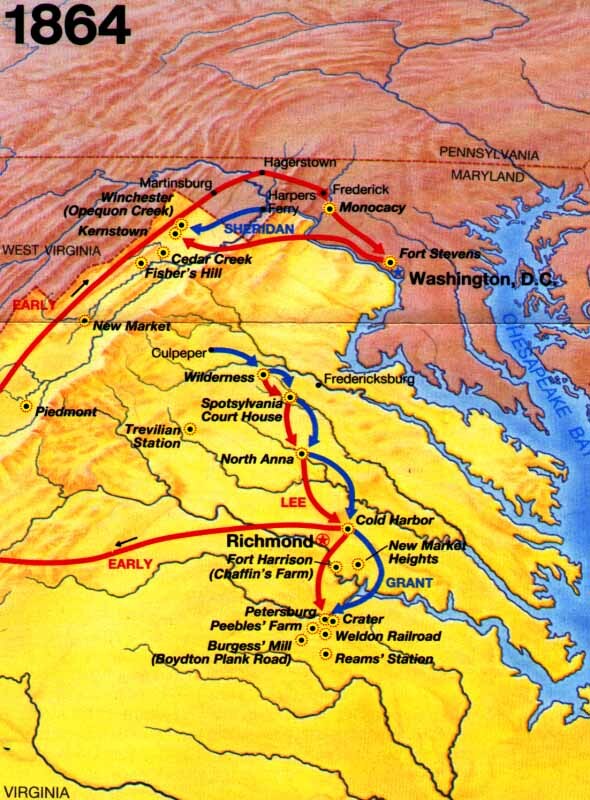 North and South met and fought in an inconclusive three- day battle in the Wilderness. Lee inflicted more casualties on the Union forces than his own army incurred, but unlike Grant, he had no replacements. May The Battle of Spotsylvania. General Grant continued to attack Lee. At Spotsylvania Court House, he fought for five days, vowing to fight all summer if necessary. 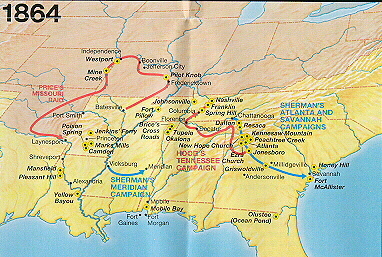 Confederate forces under General P.G.T. Beauregard attacked Butler's Bermuda Hundred line near Ware Bottom Church. About 10,000 troops were involved in this action. After driving back Butler's advanced pickets, the Confederates constructed the Howlett Line, effectively bottling up the Federals at Bermuda Hundred. Confederate victories at Proctor's Creek and Ware Bottom Church enabled Beauregard to detach strong reinforcements for Lee's army in time for the fighting at Cold Harbor. June The Battle of Cold Harbor. 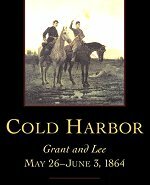 Grant again attacked Confederate forces at Cold Harbor, losing over 7,000 men in twenty minutes. Although Lee suffered fewer casualties, his army never recovered from Grant's continual attacks. This was Lee's last clear victory of the war. 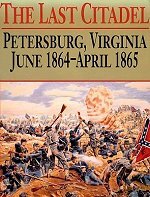 June 1864 -- The Siege of Petersburg. 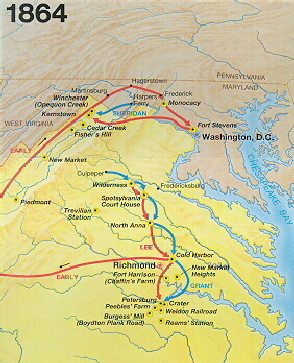 Grant hoped to take Petersburg, below Richmond, and then approach the Confederate capital from the south. The attempt failed, resulting in a ten month siege and the loss of thousands of lives on both sides, Grant won by steadily extending his lines westward. 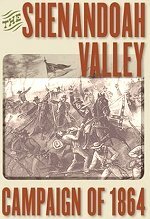 The Siege of Petersburg was the prelude to the final chapter of our Nation's Civil War. July -- Confederate Troops Approach Washington, D.C.
August 2-23 -- Mobile Bay / Fort Morgan / Fort Gaines Alabama. A combined Union force initiated operations to close Mobile Bay to blockade running. Some Union forces landed on Dauphin Island and laid siege to Fort Gaines. On August 5, Farragut's Union fleet of eighteen ships entered Mobile Bay and received devastating a fire from Forts Gaines and Morgan and other points. After passing the forts, Farragut forced the Confederate naval forces, under Adm. Franklin Buchanan, to surrender, which effectively closed Mobile Bay. By August 23, Fort Morgan, the last big holdout, fell, shutting down the port. The city, however, remained uncaptured. 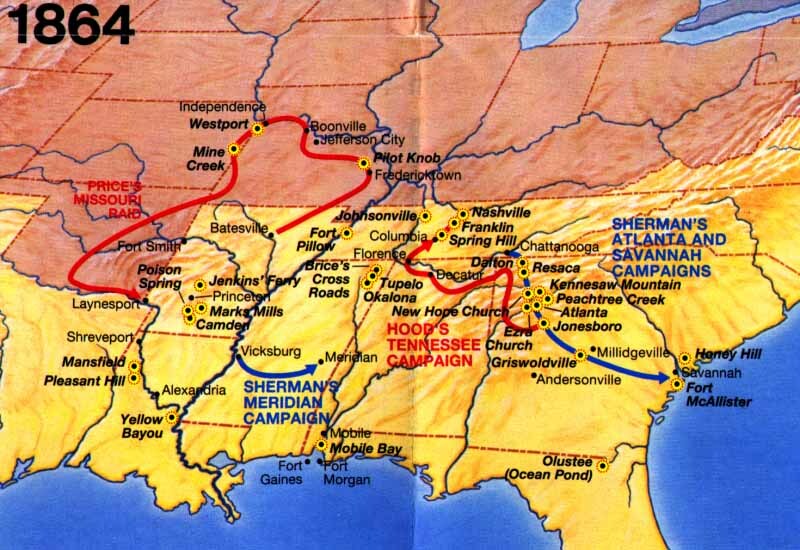 August 1864 -- General Sherman's Atlanta Campaign. Union General William T. Sherman departed Chattanooga, and was soon met by Confederate General Joseph Johnston. Skillful strategy enabled Johnston to hold off Sherman's force -- almost twice the size of Johnston's. However, Johnston's tactics caused his superiors to replace him with General John Bell Hood, who was soon defeated. Hood surrendered Atlanta, Georgia, on September 1; Sherman occupied the city the next day. The fall of Atlanta greatly boosted Northern morale.